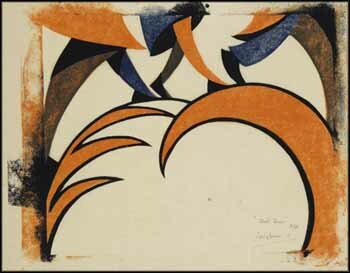 The Grosvenor School of printmakers, to which Sybil Andrews belonged, was strongly influenced by Futurism. Futurist artist F.T. Marinetti stated, "We declare that the world's splendour has been enriched by a new beauty; the beauty of speed." Whether manifested in the movement of machines or the fast pace of urban life, this speed became an important theme in Andrews's linocut prints. She depicted racing motorcycles in Speedway and urban dynamism in Rush Hour. Stephen Coppel writes: “Inspired by the Futurists’ challenge to depict the modern machine age, Andrews, like Power, presents the London Underground as the obvious symbol of modernity. The marching feet of commuters on the escalators are treated as a series of abstracted arcs and curves, suggestive of hurried movement." Coppel records that Andrews originally called this print Escalator, but changed it to Rush Hour to avoid confusion with Cyril E. Power’s The Escalator. 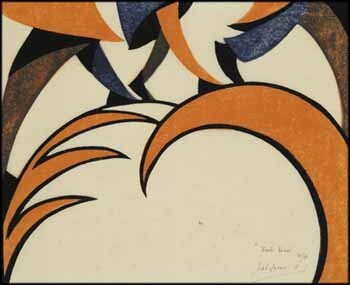 This dynamic linocut was featured on the front and back inside cover of the catalogue for the excellent 2008 show on modernist British prints at Boston’s Museum of Fine Arts. This is a fine impression is on thin cream oriental laid paper.